We read somewhere that Madhur Jaffrey (Indian cooking legend) learned to cook only after she moved to London for university. Her mother would send her recipes from home to ease her homesickness and the rest is history. Now we learned how to cook much earlier than that, but our mother still likes to supplement our cooking knowledge by tearing out the pages of food magazines and supplements and bringing them to us whenever she visits. And then at Christmas, we have the additional job of going through maybe 30 magazines she’s saved to make sure she hasn’t missed anything good. Many of the recipes are actually written by top chefs from Dubai hotels and most of them are Indian, which means that most of the recipes tend to be Indian or have an Indian twist. This is great for us, because it means we can supplement our knowledge of Indian home cooking with dishes that are meant to impress or are a little tricky/time-consuming. You know very well by now that we love coming up with interesting updates to existing recipes, but poring over the torn pages this weekend inspired us to go back to some of our favourites. 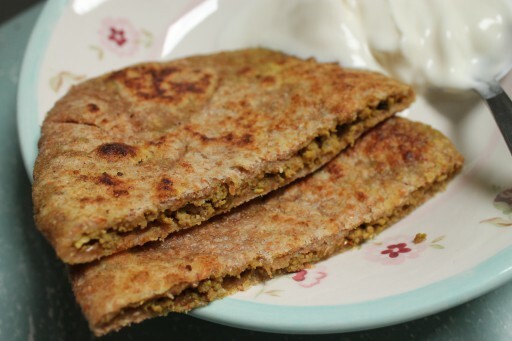 Take the humble keema paratha, found in Indian restaurants and cafes and served hot with pickle. 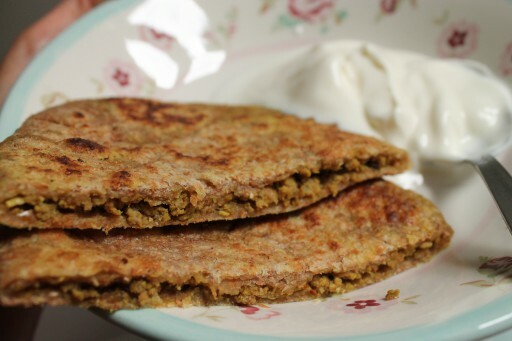 It makes a great quick snack or lunch – heavily spiced minced lamb stuffed into an Indian flatbread. It’s also really tricky to make, which is probably why we never make it at home, preferring to leave it to the professionals. The reason why is because the minced meat doesn’t hold together like mashed potato or mashed mackerel or mashed radish (some other options). You also have to be really careful that the mixture isn’t too oily otherwise it’ll leak whilst you’re rolling the parathas. It can get really frustrating but you just have to persevere. Because once you’ve made them, you’ll realise that they are SO worth the effort. Heat ghee in a large heavy sauce pan on medium heat. Add cumin, onion, garlic and ginger and saute for 2 minutes until the onion is golden. Add the turmeric, coriander, cinnamon and clove powders, red chilli flakes, garam masala and saute for 2 minutes. Add the lamb and mix well. Lower the heat and cook for 10 minutes until the lamb is fully browned. Stir frequently. Season with salt and take the pan off the heat. Leave aside to cool. In a bowl, add the flour, 1 tsp salt and enough water to form a slightly sticky, pliable dough. Knead for about 1 minute. Divide into about 10 pieces or do what we did and just break off golf-ball size pieces of dough. Place 1-2 tbsp of mince at the centre of each disc. Bring up the edges to seal and roll out again (SUPER carefully) to a medium-sized disc. Don’t worry if some of the lamb bursts through! This is not an exact science. Fry the parathas on the flattest oiled frying pan you can find until golden brown on both sides. Eat immediately with fresh yoghurt and pickle or freeze for a quick meal at a later date!